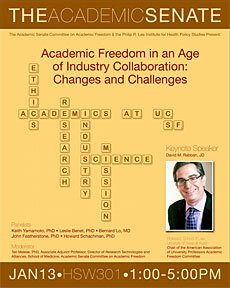 The symposium was held on January 13, 2010 to educate the community about academic freedom and to allow the community to hear from leaders from all the Schools about their thoughts regarding our multiple missions, and the lessons they learned from their experiences with industry collaborations. We also hoped to give the audience the opportunity to pose questions to our campus leaders about industry partnerships and to express any concerns they might have about such collaborative research efforts. The committee also wished to provide a forum for discussion of the importance of industry collaborations, and the equally important concept of aligning such research activities with our academic missions. The Academic Freedom Committee felt that as a community, we have had little opportunity to openly and broadly discuss the concept of academic freedom and its relationship to conflicts of interest that might develop as we seek to fulfill our missions. How we disseminate our knowledge, expertise and know-how with those life science companies that will ultimately bring new therapies to market is extremely important. Is publishing enough to transfer our knowledge? Will more ideas be translated to therapies as a result of working together? What do we sacrifice? What do we gain? How do we manage these relationships properly as opposed to avoiding them and the conflicts that are likely to arise?